Risk Factors are high for those residing with infected persons, traveling to areas with high concentrations of Hepatitis A and participating in sexual relations with an infected person. Getting vaccinated is your best defense against Hepatitis A. 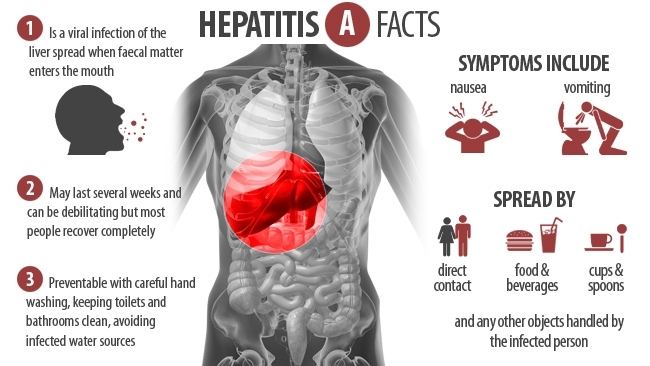 If you come in contact with someone with Hepatitis A, you should acquire the medication immune globulin within 2 weeks of exposure. Another defense is practicing good hygiene by washing your hands with soap and water after using the bathroom, before and after handling food or contact with soiled diapers and undergarments. The vaccine is administered by your physician in doses and is urgently recommended for anyone who may have been or may be soon exposed to the hepatitis virus. This includes all of the At Risk for Contamination persons as above referenced, plus persons with blood clotting difficulties or diagnosed with a long-term liver disease. While there is no set treatment for this strain of hepatitis, your physician will monitor you to determine that your liver is strengthening and healing. In healthy individuals, symptoms will cease in about sixty days. If the liver does not heal and deteriorates without the availability of treatment, the only recourse for the patient is to become a candidate for liver transplant, a stressful and serious procedure that is not always successful and requires prescribing of drugs affecting the auto- immune system, increasing the patient’s risk for other diseases. Fortunately, you can only become ill with Hepatitis A once if you have a healthy body to begin with, as your healthy body will build its own defense against a future infection. The disease can spread quickly in children’s day care centers. Workers could spread the virus if they don’t wash their hands thoroughly after changing each diaper. Washing their hands and putting dirty diapers in a covered diaper pail will help prevent Hepatitis A spreading into all age groups attended as well as all staff and personnel. Children also spread the disease as well as similar ailments due to children not yet being well trained in safe hygiene in their toilet habits. Contamination can spread very fast through a day care center if the hygiene of children and staff is not strictly enforced and watch-dogged. Hepatitis Branch of the U. S. Center for Disease Control. These agencies provide educational materials and group support assistance for family members as well as patients affected by Hepatitis A.